DANBURY, Conn., Feb. 6, 2019 /PRNewswire/ -- Cartus Corporation, a Realogy company and the market leader in global mobility, has a dedicated focus on creating innovative technology for clients, customers, partners, and employees. With key leadership in place and a clear strategy, Cartus is poised to drive the business forward by building expertise in areas such as product innovation, digital transformation, and predictive analytics. The recently launched version of the new client interface in CartusOnline® is the first of many planned tech enhancements Cartus will be unveiling over the coming months. This latest reinvigorated version incorporates dynamic data analytics while offering a modern look and feel for an enhanced user experience. All clients will benefit from advanced business intelligence and data visualization right on their homepage. In a truly collaborative effort, the Product Solutions team aligned with Cartus Account Management to develop this new client experience. The redesigned client interface provides enhanced access to tools and incorporates key features based on client suggestions and feedback. 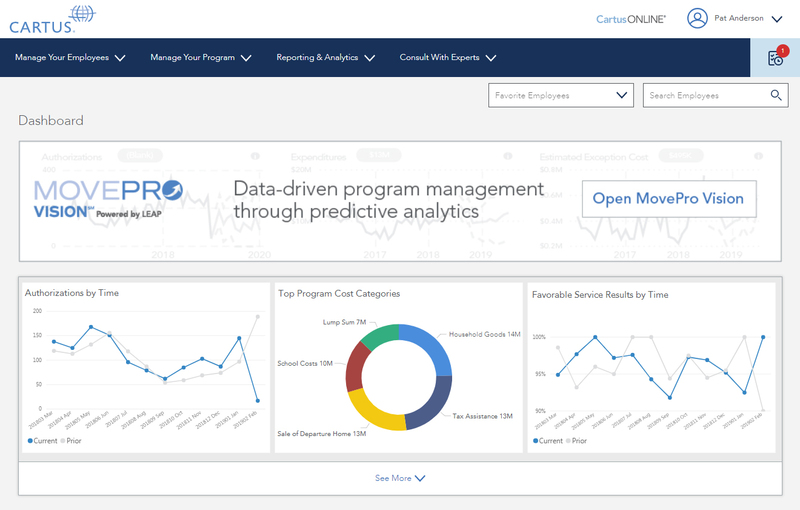 Cartus recently unveiled their next predictive analytics innovation for global relocation, MovePro VisionSM. MovePro Vision is the first client-facing product designed to anticipate events and provide data-driven decision support during the corporate relocation process. Clients who have completed a statistically significant number of moves—which is required to generate the data needed to fully benefit from this technology—can designate MovePro Vision access to key mobility leaders. 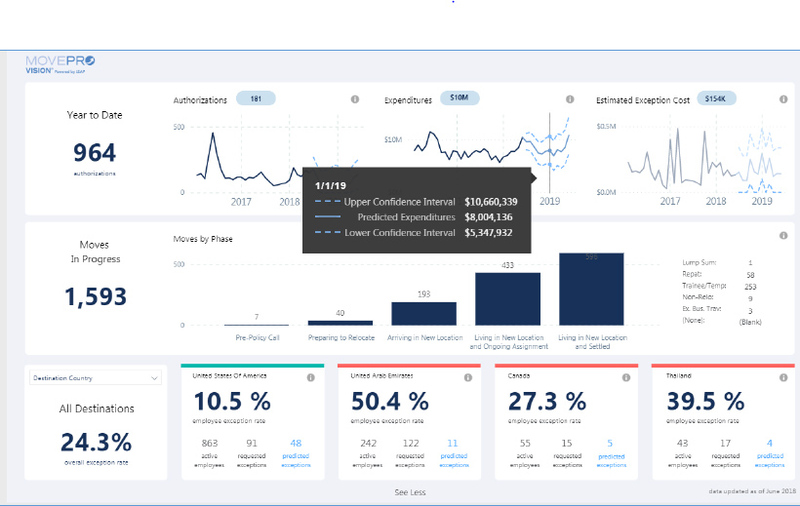 MovePro Vision is powered by LEAP, Cartus' Leading Edge Analytics Practice, which predicts and develops insights based on the company's rich history of industry-exclusive data. David Pascoe, Senior VP EMEA & APAC: "Whether you're managing dozens of moves in a single country or thousands of assignments across multiple continents, relocation is a complex machine. Our reinvigorated client experience simplifies the entire online management process by putting the most relevant tools and information at your fingertips from the initial log in. From verifying expenses, authorizing new assignments, or predicting exception trends, the new client experience is designed to provide our clients what they need to make their job easier and your employees' moves better." Michelle Vallejo, Senior VP Americas: "It is an exciting time to be at Cartus. We have a sharp focus on developing technology that delivers substantial benefits for our clients and customers. We initiated in-depth discussions with a variety of stakeholders and were able to incorporate many of their ideas and suggestions into our new client interface. The result is a clean and fresh look with easy–to-navigate pages filled with pertinent information." Nica Ganley, Vice President Analytics and Technology Solutions: "Cartus' technology evolution is focused on creating a smarter and more intuitive digital experience across all of our products and services. With our shift to an Agile Development model, we will be able to meet client needs in a timely manner while offering flexibility in adapting to their changing priorities." Cartus, the market leader in global mobility, provides a full spectrum of global relocation solutions and can successfully move employees into and out of 185 countries. By leveraging innovative solutions and its Leading Edge Analytics Practice (LEAP), Cartus serves more than half of Fortune 50 companies as well as smaller organizations. Cartus is part of Realogy Holdings Corp. (NYSE: RLGY), a global leader in real estate franchising and provider of real estate brokerage, relocation and settlement services. To find out how our greater experience, reach, and hands-on guidance can help your company, visit www.cartus.com, read our blog, or visit www.realogy.com for more information.